Today’s manicure is one of my favorites. I haven’t had a favorite in a really long time now. 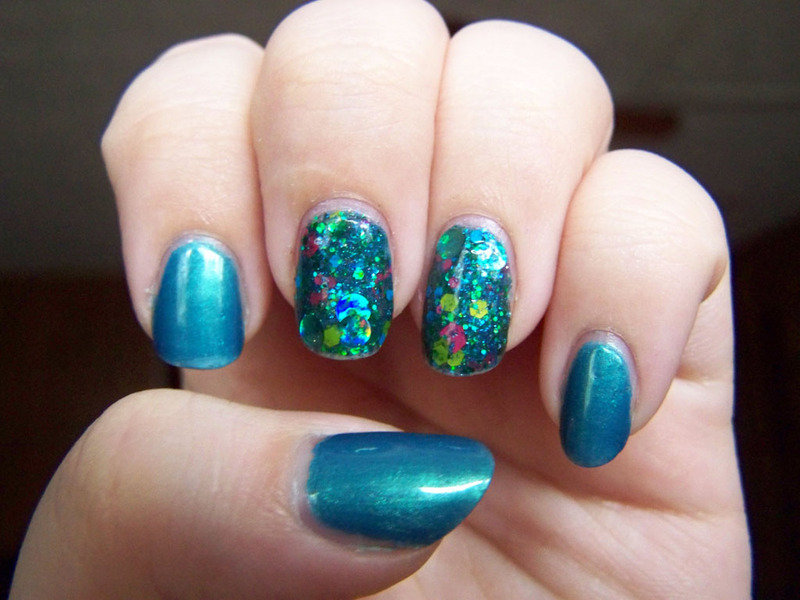 My two colors this week are Sephora by OPI’s Skinny Jeans and Digital Nails’s Wibbly Wobbly. I really love how it came out. I thought the nails without the glitter would be too plain, but the colors actually work really well and I don’t feel like the rest of my nails are too plain. This is a fantastic match. 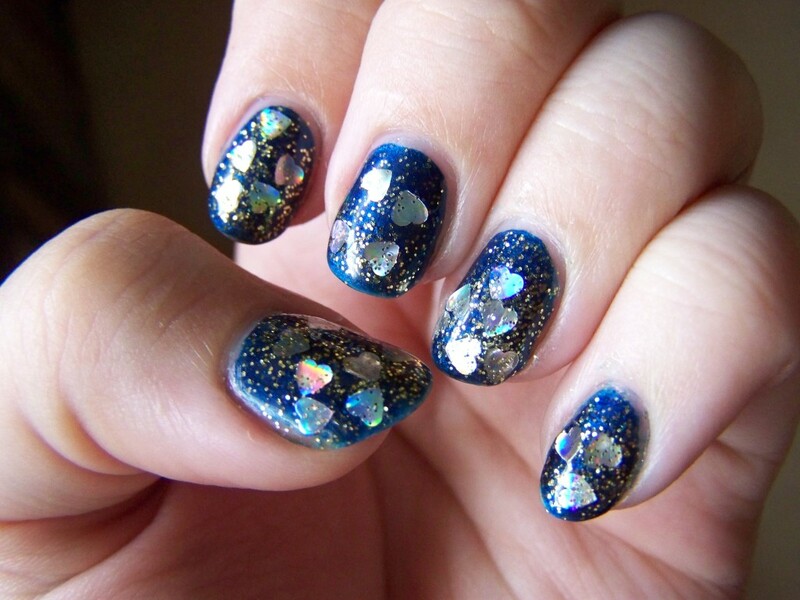 Something else I worried about was the glitter going on too thick and making the nails fat. That didn’t happen the way it did with this glitter. I brushed the glitter on instead of dabbing it, so maybe that made a difference. 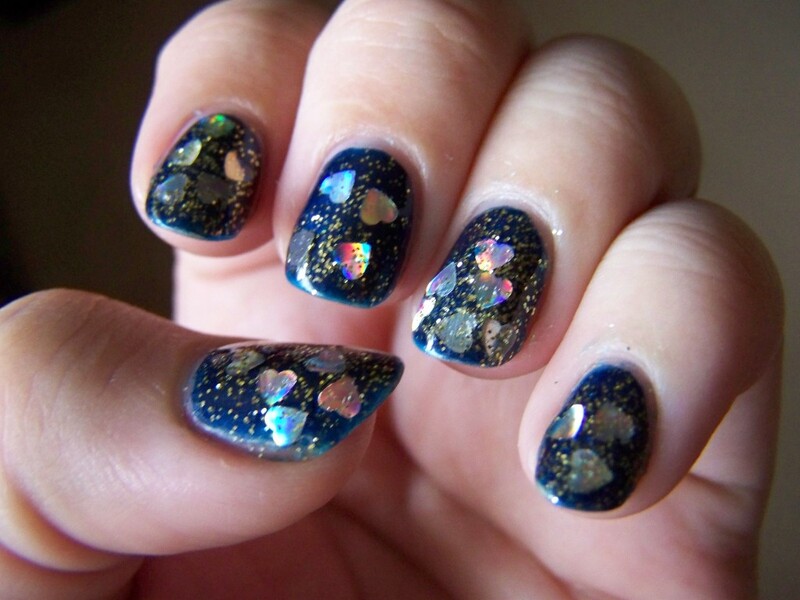 I could have just Wibbly Wobbly as a glitter topper, but I really wanted that multi-layered glitter look. I’m pleased as hell with how it turned out. 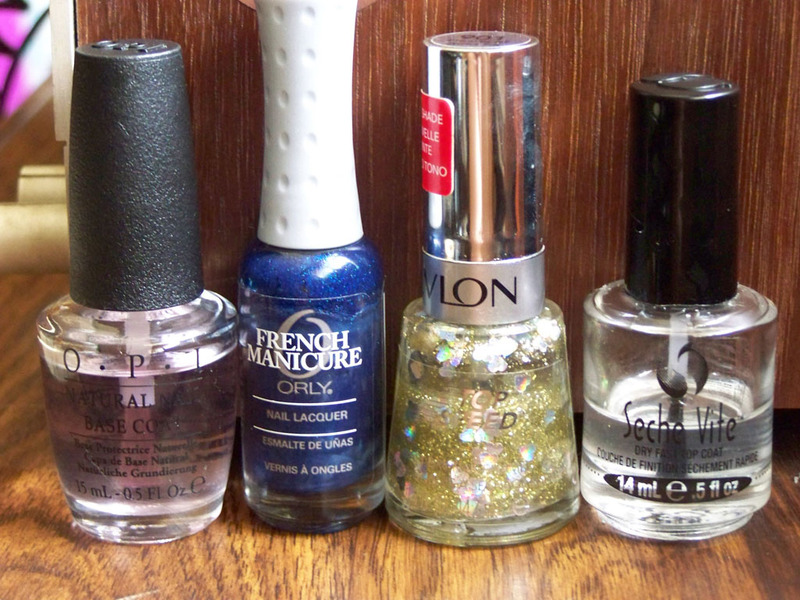 So, a little something about Wibbly Wobbly: I think it’s the polish that sold me on indies. I saw a Reddit post with Wibbly Wobbly over black, and I’d never seen anything like it before: all those different glitters, the huge dot glitters… I needed it. I went to buy it immediately after, but I reigned myself in somehow, even though there was like one bottle left and it seemed like destiny. 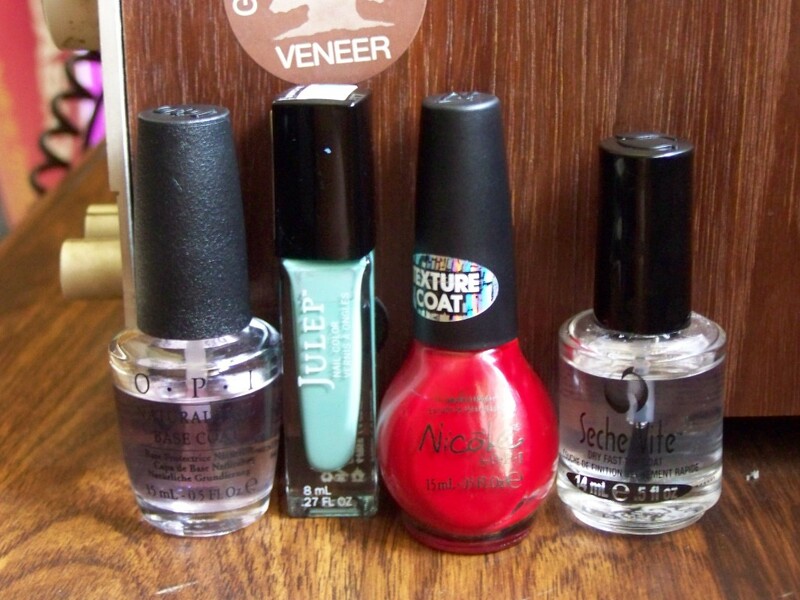 I couldn’t bring myself to pay ten dollars plus shipping for a bottle of polish. When I got a prize for being a finalist in a game design contest, all that went out the window. 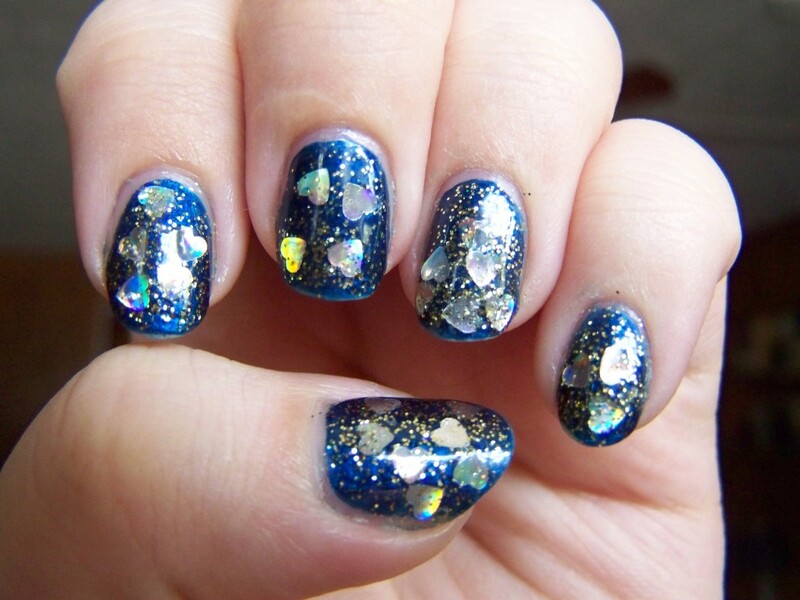 Ultimately, it’s this polish that led to my delightful indie polish problem. I waited until the coffee kicked in to start this entry. Best coffee is best best best coffee best. Note the blue cuticle on the middle finger. I had a hell of a time getting my cuticles clean. This week I faced two challenges: having a polish that stained my cuticles to hell, and trying to get large glitter out of a bottle. My blue polish, Orly’s Witch’s Blue, is a beautiful jewel color. It’s dark and mysterious and dramatic. 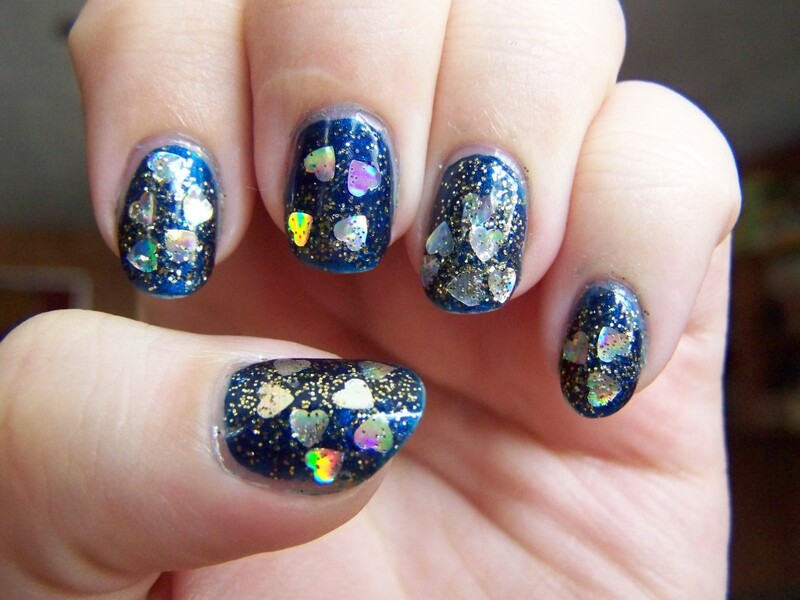 I knew the holo gold hearts in Revlon’s Hearts of Gold would stand out nicely against it. What I didn’t count on, though, was the fine gold glitter overpowering the background color, or the haphazard way the hearts landed. I did manipulate them a little with a toothpick, but mostly wherever they are is where they landed. Also, I really had to work for these hearts. A little further down, you’ll see that the Revlon bottle is about a third of the way empty. Yeah. I wasted a good bit of it just trying to get the hearts out. I went back and traced my cuticles after I took that first photo. It’s better now. I love the colors in the hearts, though. 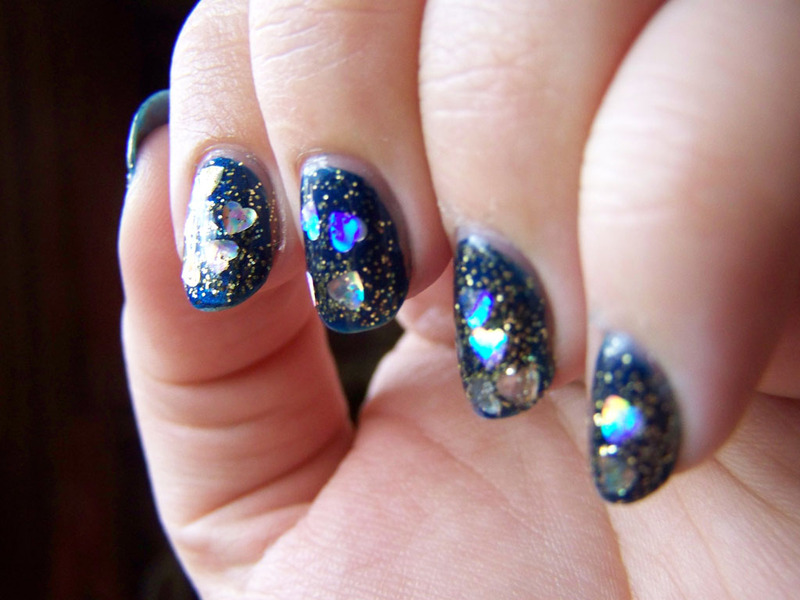 Holo glitter is beautiful! I just keep looking at my nails and fanning them back and forth to watch the rainbow. 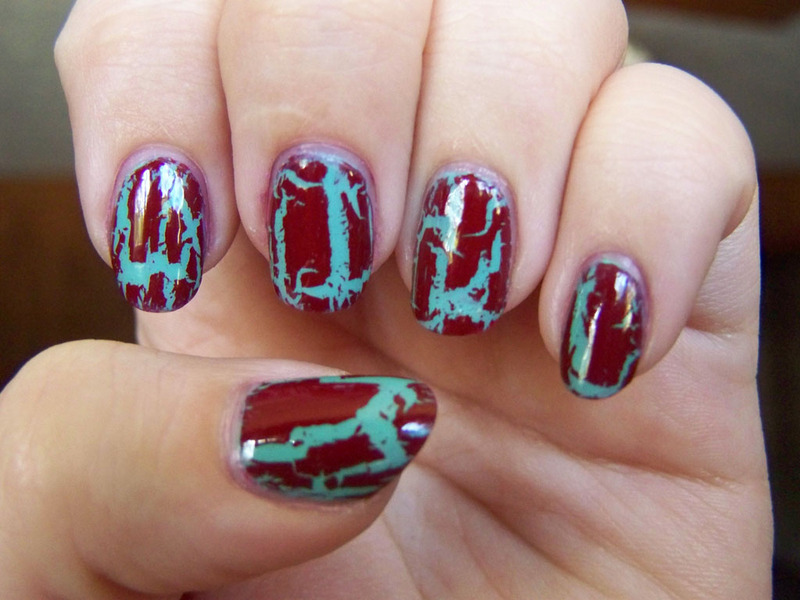 They’re kinda messy, kinda sloppy, but I’m into it. This week I have two fantastic polishes and a beautiful shiny gradient.If it wasn’t so gross and cold and overcast outside, these nails would be absolutely blinding. I started with two coats of OPI’s Austin-tatious Turquoise. It’s a bottle I’ve had for a few years now, acquired in that legendary Ulta haul where I had a ton of reward points and left the store with like ten bottles of OPI. I don’t know, the bottle count changes each time I remember it. It’s like a fishing story. Unfortunately, I had a lot of problems with this color. The first coat was thin and uneven; the second did not cover or improve anything. 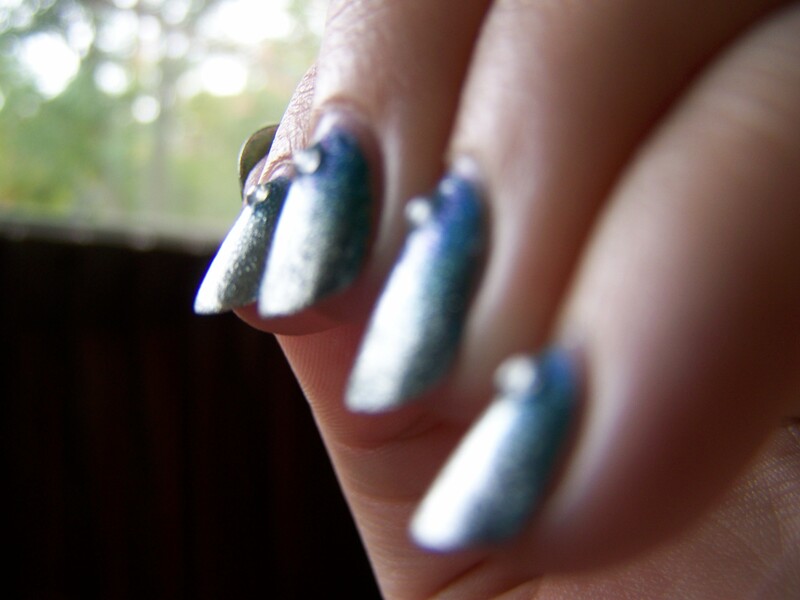 I was only able to gain opacity when I started sponging it on to create the gradient. I was really disappointed by it, because it’s beautiful in the bottle. It takes a lot of work to get it to look good on my nails. This is me trying to demonstrate the duochromatic properties of Austin-tatious Turquoise. It almost worked. Shine is the total opposite. Opaque in two coats, it makes this gradient reflective and, well, shiny. There isn’t a better name for this polish. 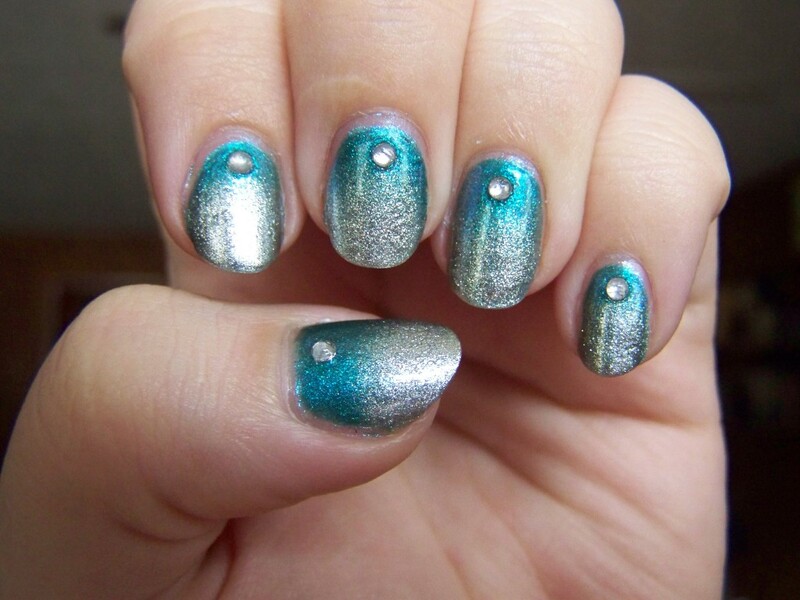 I liked the silver so much, I added a rhinestone to each nail to add more. Overkill? Probably. Pretty? Totally!